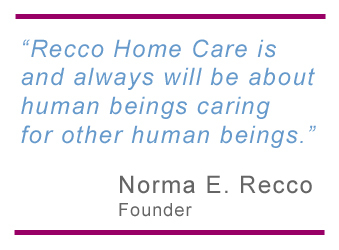 Recco Home Care Service, Inc. was founded by Norma E. Recco in 1970. Under her compassionate, yet keen management style, Recco grew to include five office locations – Massapequa, Smithtown, East Quogue, Queens and Westchester. Norma Recco’s vision to create an industry standard by which people can stay in their own homes under difficult health circumstance has been recognized throughout New York State and she has been credited as a pioneer in the home care industry. Her ability to find caring, compassionate people to go into homes and take care of individuals in need was her greatest attribute. From homebound seniors to the mentally and physically challenged and those in need of assistance after surgery or illness, Norma Recco has altered the face of home health care forever. 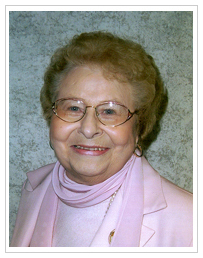 She was a passionate advocate and powerful voice for advances in home and community based care. While busy raising her family and running a business, Norma still found time to participate in community and industry affairs. She was President of the Massapequa Chamber of Commerce from 1978 to 1980. In the early 1970’s, several home care agencies on Long Island joined forces and formed the New York State Association of Health Care Providers, Inc. (HCP). Norma was one of the co-founders of this organization and served as President from 1980 – 1986. Over the years, HCP has grown to include approximately 400 members and Recco Home Care is proud to remain one of them. As HCP grew from its roots on Long Island, Norma became active on a state level. From 1987 to 1997 she was the Governor’s Appointee to the New York State Home Care Council. Over the years Norma served on many state and federal work groups, advisory committees and task forces. She was truly an industry leader. In 2008, she received the Women of Distinction Award from the NYS Assembly. Norma was a tireless advocate for the home care industry both in Albany and on Long Island. When someone you love needs care, call the name you can trust….RECCO…puts the heart in home care and gives you Peace of Mind!